For SunTrust , what a difference a year makes. During last year's stress tests, SunTrust got a bit of a black eye as its capital plans were rejected by the Federal Reserve. Fast forward to this year, and the bank looks like it's in a much better position. Unlike the Fed's Comprehensive Capital Analysis and Review -- which comes out next week -- the Dodd-Frank stress tests do not determine whether or not the banks involved can pay higher dividend or pay out stock. But since they use essentially the same modeling and stress-case scenarios, they're a good way for investors to get a sense for how the banks will perform in the CCAR, and whether they'll be able to increase capital distributions. Perhaps the key metric that the Fed and investors are looking at in the results of the stress tests is the Tier 1 common capital ratio, and, in particular, how that low that ratio falls under the hypothetical stressed conditions. Here's a look at how that ratio looked for SunTrust -- both pre-test actual and under stressed conditions -- as compared to similar numbers during last year's CCAR tests. The outcome of the tests is practically night and day when compared to last year. What accounts for the change? Part of it was the bank's lower projected loss. In last year's CCAR, the Fed projected that SunTrust would lose nearly $6 billion under the stress scenario. This year, that loss fell to just $4 billion. But let's dig in a bit further on that loss projection. How do the regulators get to the stressed capital ratios? A big piece of the puzzle is using the stress-scenario inputs to estimate how much of a profit -- or, in most cases, a loss -- the bank will register over the nine-quarter test period. 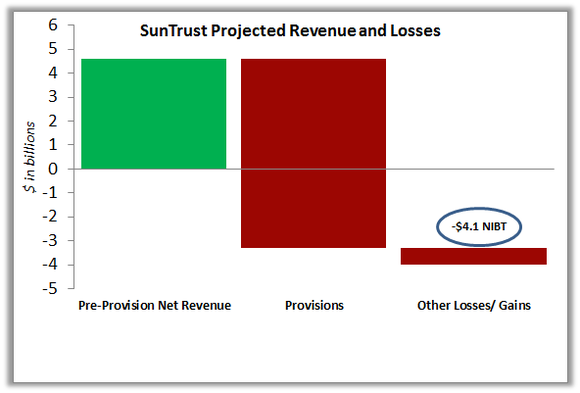 In SunTrust's case, the answer is a $4 billion loss on $4.6 billion of pre-provision net revenue -- that is, revenue before loan-loss provisions less operating expenses. Compared to the CCAR results last year, SunTrust was projected to have both lower loan-loss provisions -- $7.9 billion versus $8.5 billion -- and markedly higher PPNR -- $4.6 billion versus $2.7 billion. Finally, if we break down those loan losses, we can see where the Fed projects that SunTrust would take the biggest balance-sheet hits in the hypothetical stressed scenario. Thanks to SunTrust's asset mix -- which is lighter on some higher-loss loan types like credit cards -- its overall loss rate as a percentage of its loans was 6.4%, which was slightly below the median across all of the tested banks. With SunTrust's stock up close to 3% today, investors may be looking at the stress test results expecting redemption for last year when the CCAR rolls around next week. And I couldn't blame them for thinking that way. With notably high post-test capital ratios, SunTrust does look much better positioned this year to return capital to its shareholders. But with the misfire of last year likely still ringing in management's ears, I can't help but wonder whether they're ready for a big capital request, or if they'll play it safe and put it off another year. Like SunTrust, fellow regional bank Regions Financial is a clear comeback story that performed well during the Dodd-Frank stress tests. But does that mean Regions Financial is a buy today? To find out, I invite you to read our premium research report on the company today. Click here now for instant access. The article Here's How SunTrust Fared in the Stress Tests originally appeared on Fool.com. Matt Koppenheffer has no position in any stocks mentioned. The Motley Fool has no position in any of the stocks mentioned. Try any of our Foolish newsletter services free for 30 days. We Fools may not all hold the same opinions, but we all believe that considering a diverse range of insights makes us better investors. The Motley Fool has a disclosure policy.